Introduction: This article was published in the May 1891 issue of Frank Leslie's Popular Monthly. It quotes Cyrus Field's recent comments on the cable industry at that tme, and as Field died the following year these are probably some of his last words on a subject which occupied a good portion of his life. The article's survey of worldwide cable communication is also useful in describing the actual routes that messages would take between various destinations, a topic not often touched on. 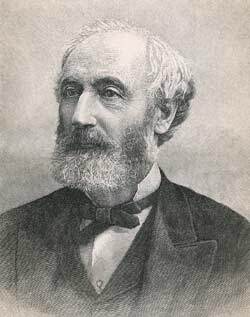 Cyrus W. Field, the father of the transatlantic cable, has lately expressed his opinion that, marvelous as are the results that have been accomplished within the past quarter of a century, submarine telegraphy is as yet only in its infancy. “To no one does the remarkable development in deep-sea telegraphy seem more wonderful than to me,” says Mr. Field. “As I look back to the time of the first line, it hardly seems credible. The first meeting to discuss the laying of an Atlantic cable was held downstairs here in my dining room, in March, ’54, and there the first company was formed. The money to defray the cost of this cable, which was really only an experiment, was counted out on my dining table. At that time there was but one cable in the world, and that was resting in only 200 fathoms of water, between England and France. Our cable, which we had to sink in 3,000 fathoms, only lasted a few weeks. It was laid four years after the meeting in my house. In 1866 we laid the second, stretching from Newfoundland to Ireland, and this worked successfully. In 1867, thirteen years after our meeting in my dining room, the first dividend was paid on a cable investment. Now over $100,000,000 is invested in deep-sea lines running between America and Europe. Of all the persons who met to organize the first cable company I believe that I am the only one alive to-day. “When the cable was opened for business in 1866 the messages for several weeks did not exceed a daily average of 50 each way. To-day they average 5,000. The rate at that time was $5 a word for ordinary messages and $10 a word for cipher dispatches. Less than 20 words was not accepted—that is, the least a message would be taken for was $100 for plain English and $200 in cipher. The United States Government paid us $19,000 for a message sent to Paris. It related to the demand that the French troops must evacuate Mexican territory. The Russian Government sent a number of long messages, for one of which, I remember, we got $11,000, while the New York Herald often sent cables that cost $5,000 for transmission. To-day you can send messages across at 25 cents a word for as many words as you like. We get lots of messages that contain only two or three words. Press matter is sent at half rates. “In a few years I feel certain that a cable will be stretched across the Pacific, connecting San Francisco with Japan. It will run from the California coast to the Sandwich Islands, and from thence to Japan, with a branch line to China. As soon as this line is established it will give an immense impetus to our Asiatic trade. The Atlantic cable lines have made possible for us a commercial development in the European markets that would never have been attainable without telegraphic communication. We would have remained isolated to a large extent, and our national progress would not have approached its present dimensions for many years to come. “It will be the same in the Orient. Once we get direct telegraphic communication our trade will double and treble. Even now we can cable to China and Japan, or almost any part of the world, but it is too expensive for ordinary commercial uses. Then, too, a Pacific line will give us direct communication with the other hemisphere in case war among the big European powers should cut off our Atlantic lines. There are at present twenty-six submarine cable companies, the combined capital of which is $200,000,000. Their revenue, including subsidies, amounts to $16,020,300, their reserves and sinking funds to $18,050,000, and their dividends are from 1 to 14¾ per cent. The receipts from the Atlantic cables alone amount to about $4,000,000 annually. The number of cables laid down throughout the world is 1,045, of which 798 belong to governments and 247 to private companies. The total length of those cables is 120,070 nautical miles, of which 107,546 are owned by private telegraph companies, nearly all British; the remainder, or 12,524 miles, are owned by governments. The largest telegraphic organization in the world is that of the Eastern Telegraphic Company with seventy cables of a total length of 21,859 nautical miles. The second largest is the Eastern Extension, Australasia and China Telegraph Company, with twenty-two cables of a total length of 12,958 nautical miles. The Eastern Company work all the cables on the way to Bombay, and the Eastern Extension Company from Madras eastward. The cables landing in Japan, however, are owned by a Danish company, the Great Northern. The English station of the Eastern Company is at Porthcurno, Cornwall, and through it passes most of the messages for Spain, Portugal, Egypt, India, China, Japan and Australia. The third largest cable company is the Anglo-American Telegraph Company, with thirteen cables of a total length of 10,196 miles. The British Government has one hundred and three cables around its shores of a total length of 1,489 miles. If we include India and the colonies, the British Empire owns altogether two hundred and sixteen cables of a total length of 3,811 miles. The longest government cable in British waters is that from Sinclair Bay, Wick, to Sandwick Bay, Shetland, of the length of 122 miles, and laid in 1885; the shortest being four cables across the Gloucester and Sharpness Canal, at the latter place, and each less than 300 feet in length. Of government cables the greatest number is owned by Norway, with two hundred and thirty-six, averaging, however, less than a mile each in length. The greatest mileage is owned by the Government of France with 3,269 miles of the total length of fifty-one cables. The next being British India, with 1,714 miles and eighty-nine cables; and Germany third, with 1,579 miles and forty-three cables. Britain being fourth, with ninety miles less. The oldest cable still in use is the one that was first laid—that, namely, from Dover to Calais. It dates from 1851. The two next oldest cables in use being those respectively from Ramsgate to Ostend; and St. Petersburg to Cronstadt, and both laid down in 1853. Several unsuccessful attempts were made to connect England and Ireland by means of a cable between Holyhead and Howth; but communication between the two countries was finally effected in 1853, when a cable was successfully laid between Portpatrick and Donaghadee (31). As showing one of the dangers to which cables laid in comparatively shallow waters are exposed, we may relate the curious accident that befell the Portpatrick cable in 1873. During a severe storm in that year the Port Glasgow ship Marseilles capsized in the vicinity of Portpatrick, the anchor fell out and caught on to the telegraph cable, which, however, gave way. The ship was afterward captured and towed into Rothesay Bay, in an inverted position, by a Greenock tug, when part of the cable was found entangled about the anchor. The smallest private companies are the Indo-European Telegraph Company, with two cables in the Crimea of a total length of fourteen and a half miles; and the River Plata Telegraph Company, with one cable, from Montevideo to Buenos Ayres, thirty-two miles long. The smallest government telegraph organization is that of New Caledonia, with its one solitary cable one mile long. We will now proceed to give a few particulars regarding the companies having cables from Europe to America. Map Showing the Main Cables from Europe, and their Connections with Canada and the United States. References to Places—A, Heart’s Content; B, Placentia; C, St. Pierre Miquelon; D, North Sydney, Cape Breton Island; E, Louisbourg; F, Canso, Nova Scotia; G, Halifax; H, Bird Rock; I, Madeline Isles; J, Anticosti; K, Charlotte Town, Prince Edward’s Isle; LLL, Banks of Newfoundland. The most important company is the Anglo-American Telegraph Company, whose history is inseparably connected with that of the trials and struggles of the pioneers of cable laying. Its history begins in 1851, when Tebets, an American, and Gisborne, an English engineer, formed the Electric Telegraph Company of Newfoundland, and laid down twelve miles of cable between Cape Breton and Nova Scotia. This company was shortly afterward dissolved, and its property transferred to the Telegraphic Company of New York, Newfoundland and London, founded by Cyrus W. Field, and who in 1854 obtained an extension of the monopoly from the government to lay cables. A cable, eighty-five miles long, was laid between Cape Breton and Newfoundland (22). Field then went to England and floated an English company, which amalgamated with the American one under the title of the Atlantic Telegraph Company. The story of the laying of the Atlantic cables of 1857 and 1865, their successes and failures, has often been told, so we need not go into any details. 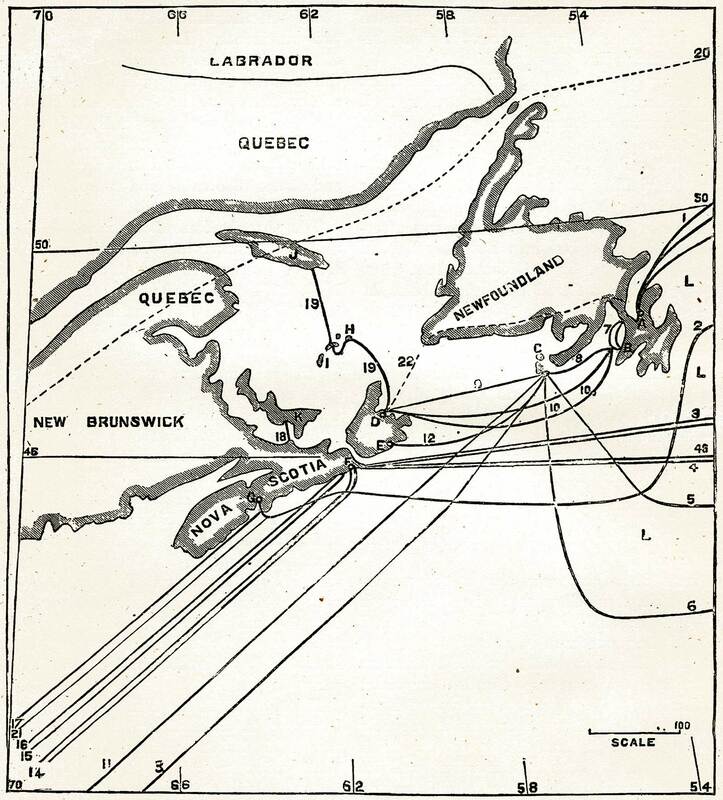 It may be noted, however, that communication was first established between Valentia and Newfoundland on August 5th, 1858, but the cable ceased to transmit signals on September 1st following. During that period ninety-seven messages had been sent from Valentia and some two hundred and sixty-nine from Newfoundland. At the present time the ten Atlantic cables convey about ten thousand messages daily between the two continents. The losses attending the laying of the 1865 cable resulted in the financial ruin of the Atlantic Company and its amalgamation with a new company, the Anglo-American. In 1866 the Great Eastern successfully laid the first cable for the new company, and with the assistance of other vessels succeeded in picking up the broken end of the 1865 cable and completing its connection with Newfoundland. The three cables of this company presently in use, and connecting Valentia in Ireland with Heart’s Content in Newfoundland, were laid in 1873, 1874 and 1880; and (1) are respectively 1,886, 1,846 and 1,890 nautical miles in length. This company also owns the longest cable in the world—that, namely, from Brest, in France, to St. Pierre Miquelon, one of a small group of islands off the south coast of Newfoundland, and which, strange to say, still belongs to France (6). The length of this cable is 2,685 nautical miles, or 3,092 statute miles. It was laid in 1869. There are seven cables, of a total length of 1,773 miles, connecting Heart’s Content, Placentia Bay and St. Pierre with North Sydney, Nova Scotia, and Duxbury, near Boston, belonging to the American Company. Communication is maintained with Germany and the rest of the Continent by means of a cable from Valentia to Emden, 846 miles long (7), and a cable from Brest to Salcombe, Devon, connects the St. Pierre and Brest cable with the London office of the company (10). The station of the Direct United States Cable Company is situated at Ballinskelligs Bay, Ireland (2). Its cable was laid in 1874-5, and is 2,565 miles in length. The terminal point on the other side of the Atlantic is at Halifax, Nova Scotia, from whence the cable is continued to Rye Beach, N.H., a distance of 536 miles, and thence by a land line of 500 miles to New York (17). The Commercial Cable Company’s station in Ireland is at Waterville, a short distance from Ballinskelligs (3). It owns two cables laid in 1885; the northern cable being 2,350 and the southern 2,388 miles long. They terminate in America at Canso, Nova Scotia. From Canso a cable is laid to Rockport, about thirty miles north of Boston, Mass., a distance of 518 miles, and another is laid to New York, 840 miles in length (15). This company has direct communication with the Continent by means of a cable from Waterville to Havre of 510 miles (9), and with England by a cable to Weston-super-Mare, near Bristol, of 328 miles (8). The Western Union Telegraph Company (the lessee of the lines of the American Telegraph and Cable Company) has two cables from Sennen Cove, Land’s End, to Canso, Nova Scotia (4). The cable of 1881 is 2,531 and that of 1882 is 2,576 miles in length. Two cables were laid in November, 1889, between Canso and New York (14). The Compagnie Francaise du Telegraphe de Paris a New York has a cable from Brest to St. Pierre Miquelon of 2,242 miles in length (5); from thence a cable is laid to Louisbourg, Cape Breton (12), and another to Cape Cod (13). It has also a cable from Brest to Porcella Cove, Cornwall (11). Those ten cables owned by the six companies named, of the total mileage of 22,959, not counting connections, represent the entire direct communication between the continents of Europe and North America. A new company, not included in the preceding statistics, proposes to lay a cable from Westport, Ireland, to some point in the Straits of Belle Isle, on the Labrador coast. 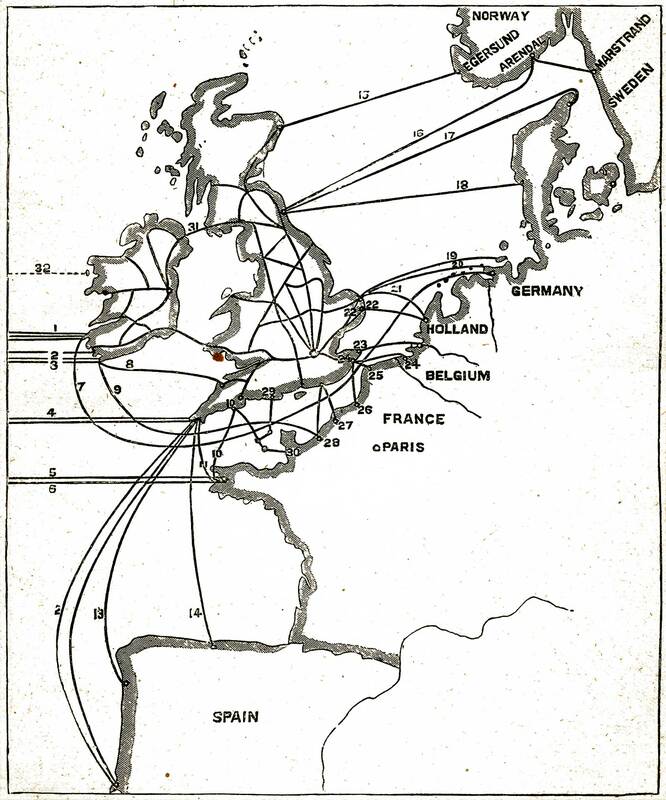 Map Showing Cables from Great Britain to America and the Continent of Europe. 1-18, Private Companies; 19-31, Government Cables; 32, Proposed Cable. The station of the Eastern Telegraph Company is at Porthcurno Cove, Penzance, from whence it has two cables to Lisbon, one laid in 1880, 850 miles long, the other laid in 1887, 892 miles long (12), and one cable to Vigo, Spain, laid in 1873, 622 miles long (13). From Lisbon the cable is continued to Gibraltar and the East, whither we need not follow it, our intention being to confine ourselves entirely to a brief account of those cables communicating directly with Europe and America. As already stated, this company has altogether seventy cables of a total length of nearly twenty-two thousand miles. The Direct Spanish Telegraph Company has a cable, laid in 1884, from Kennach Cove, Cornwall, to Bilbao, Spain, 486 miles in length (14). Coming now to shorter cables connecting Britain with the Continent, we have those of the Great Northern Telegraph Company, namely, Peterhead to Egersund, Norway, 267 miles (15), Newbiggin, near Newcastle, to Arendal, Norway, 424 miles, and thence to Marstrand, Sweden, 98 miles. Two cables from the same place in England to Denmark (Hirstals and Sondervig) of 420 and 337 miles respectively (17 and 18). The Great Northern Company has altogether twenty-two cables, of a total length of 6,110 miles. The line from Newcastle is worked direct to Nylstud, in Russia—a distance of 890 miles—by means of a “Relay” or “Repeater,” at Gothenburg. The Relay is the apparatus at which the Newcastle current terminates, but in ending there it itself starts a fresh current on to Russia. The other Continental connections belong to the government, and are as follows: Two cables to Germany, Lowestoft to Norderney, 232 miles, and to Emden, 226 miles (19 and 20). Two cables to Holland: Lowestoft to Zandvoort, laid in 1858 (21), and from Benacre, Kessingland, to Zandvoort (22). Two cables to Belgium: Ramsgate to Ostend (23), and Dover to Furnes (24). Four cables to France: Dover to Calais, laid in 1851 (25), and to Boulogne (26), laid in 1859; Beachy Head to Dieppe (27), and to Havre (28). There is a cable from the Dorset coast to Alderney and Guernsey, and from the Devon coast to Guernsey, Jersey, and Coutances, France, (29 and 30). A word now as to the instruments used for the transmission of messages. 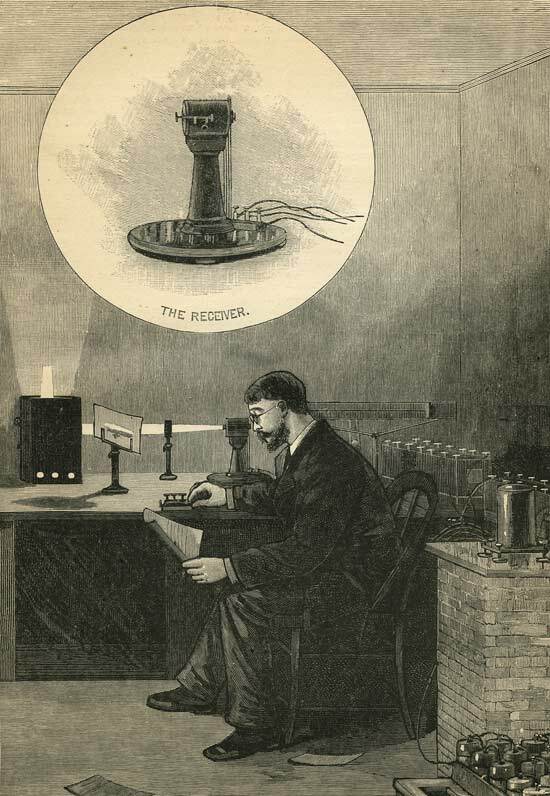 Those for cables are of two kinds, the Mirror Galvanometer, and the Syphon Recorder, both the product of Sir Wm. Thompson’s great inventive genius. When the Calais-Dover and other short cables were first worked, it was found that the ordinary needle instrument in use on land lines was not sufficiently sensitive to be affected trustworthily by the ordinary current it was possible to send through a cable. Either the current must be increased in strength or the instrument used must be more sensitive. The latter alternative was chosen, and the Mirror Galvanometer was the result. The principle on which this instrument works may be briefly described thus: The transmitted current of electricity causes the deflection of a small magnet, to which is attached a mirror about three-eighths of an inch in diameter; a beam of light is reflected from a properly arranged lamp, by the mirror, on to a paper scale. The dots and dashes of the Morse Code are indicated by the motions of the spot of light to the right and left respectively of the centre of the scale. The Mirror Galvanometer is now almost entirely superseded by the Syphon Recorder. This is a somewhat complicated apparatus, with the details of which we need not trouble our readers. Suffice it for us to explain that a suspended coil is made to communicate its motions, by means of fine silk fibres, to a very fine glass syphon, one end of which dips into an insulated metallic vessel containing ink, while the other extremity rests, when no current is passing, just over the centre of a paper ribbon. When the instrument is in use the ink is driven out of the syphon in small drops by means of an electric arrangement, and the ribbon underneath is at the same time caused to pass underneath, its point by means of clockwork. If a current be now sent through the line, the syphon will move above or below the central line, thus giving a permanent record of the message, which the mirror instrument does not; the waves written by the syphon above the central line corresponding to the dots of the Morse Code, and the waves underneath corresponding to the dashes. In order to minimize the cost as much as possible, the use of codes, whereby one word is made to do duty for a lengthy phrase, is much resorted to. Of course, these code messages form a series of words having no apparent relation to each other, but occasionally queer sentences result from the chance grouping of code words. Thus a certain tea firm was once astonished to receive from its agent abroad the startling code message, “Unboiled babies detested”! Suppose we now follow the adventures of a few cablegrams in their travels over the world. A message to India from London by the cable route requires to be transmitted eight times at the following places: Porthcurno (Cornwall), Lisbon, Gibraltar, Malta, Alexandria, Suez, Aden, Bombay. A message to Australia has thirteen stoppages; the route taken beyond Bombay being via Madras, Penang, Singapore, Banjoewangie and Port Darwin (North Australia); or from Banjoewangie to Roebuck Bay (Western Australia). To India by the Indo-European land lines, messages go through Emden, Warsaw, Odessa, Kertch, Tiflis, Teheran, Bushire (Persian Gulf), Jask and Kurrachee, but only stop twice between London and Teheran—namely, at. Emden and Odessa. Messages from London to New York are transmitted only twice—at the Irish or Cornwall stations, and at the stations in Canada. Owing to the great competition for the American traffic the service between London, Liverpool, and Glasgow and New York is said to be much superior to that between any two towns in Britain. The cables are extensively used by stockbrokers, and it is a common occurrence for one to send a message and receive a reply within five minutes. During breakages in cables messages have sometimes to take very circuitous routes. For instance, during the two days, four years ago, that a tremendous storm committed such havoc amongst the telegraph wires around London, cutting off all communication with the lines connected with the Channel cables at Dover, Lowestoft, etc., it was of common occurrence for London merchants to communicate with Paris through New York. The cablegram leaving London going north to Holyhead and Ireland, across the Atlantic to New York and back via St. Pierre to Brest and thence on to Paris, a total distance of about seven thousand miles. Three years ago, when the great blizzard cut off all communication between New York and Boston, messages were accepted in New York, sent to Ireland, and thence back to Boston. Some time ago the cables between Madeira and St. Vincent were out of order, cutting off communication by the direct route to. Brazil, and a message to reach Rio Janeiro had to pass through Ireland, Canada, United States to Galveston, thence to Vera Cruz, Guatemala, Nicaragua, Panama, Ecuador, Peru, Chili; from Valparaiso across the Andes, through the Argentine- Republic to Buenos Ayres, and thence by East Coast cables to Rio Janeiro, the message having traversed a distance of about twelve thousand miles and having passed through twenty-four cables and some very long land lines, instead of passing, had it been possible to have sent it by the direct route, over one short land line and six cables, in all under six thousand miles. Perhaps some of our readers may remember having read in the newspapers of the result of the Derby of 1889 having been sent from Epsom to New York in fifteen seconds, and may be interested to know how it was done. A wire was laid from near the winning post on the race course to the cable company’s office in London, and an operator was at the instrument ready to signal the two or three letters previously arranged upon for each horse immediately the winner had passed the post. When the race begun the cable company suspended work on all the lines from London to New York and kept operators at the Irish and Nova Scotian stations ready to transmit the letters representing the winning horse immediately, and without having the message written out in the usual way. When the race was finished the operator at Epsom at once sent the letters representing the winner, and before he had finished the third letter the operator in London had started the first one to Ireland. The clerk in Ireland immediately on hearing the first signal from London passed it on to Nova Scotia, from whence it was again passed on to New York. The result being that the name of the winner was actually known in New York before the horses had pulled up after passing the judge. It seems almost incredible that such information could be transmitted such a great distance in fifteen seconds, but when we get behind the scenes and see exactly how it is accomplished, and see how the labor and time of signaling can be economized, we can easily realize the fact. The humors of telegraphic mistakes have often been described; we will conclude by giving only one example. A St. Louis merchant had gone to New York on business, and while there received a telegram from the family doctor, which ran: “ Your wife has had a child: if we can keep her from having another to-night, all will be well.” As the little stranger had riot been expected, further inquiry was made, and elicited the fact that his wife had simply had a “chill”!—this important difference having been caused simply by the omission of a single dot.